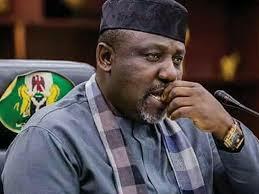 The out-going governor of Imo State, Owelle Rochas Okorocha has urged the incoming governor, Emeka Ihedioha and his associates to stop spreading rumour and creating tension in the State. According to a statement signed by the Chief Press Secretary to the governor, Sam Onwuemeodo, “it has become increasingly necessary to call on Chief Emeka Ihedioha and the PDP Chieftains vis-à-vis members of the party in the State to stop creating undue tension through their unguarded utterances and their provoking actions. The statement read further: “Governor Okorocha has run the most disciplined and truthful administration in the history of the State, with appointees of the government not known for bogus life-style or ostentatious living and nobody in the government can be associated with looting. Infact, what these PDP people are known for, is what they are imagining for others. “Again, we have also read the release by Ihedioha’s media aide telling Civil Servants in the State to stop taking directives from the government on seat or they would be “dealt with”. They specifically mentioned those in the ministry of lands and warned them to stop issuing Certificates of Occupancy. “Let’s quickly point out that “dealt with” is not the language of democracy. It was the language of the military. And for Ihedioha to be applying it only gives insight on what is to come. “We also want to ask the civil servants in the state to continue to carry out their lawful duties. There is a sitting government, and they have not committed any offence by taking directives from that government. But they will be committing offence if they take directives from a government that is yet to come.